Over the last few months, Nicolás Correa Service, S.A. has retrofitted and installed two fixed bed CORREA milling machines for a major engineering company in England. In its endeavour to improve its production quality, this company has updated its traditional production equipment through the purchase of newer, more modern CNC machines. NC Service first sold this customer a retrofitted CORREA CF22/25 milling machine and then went on to retrofit another CORREA CF22-Plus milling machine, the property of this same company, at its facilities in Burgos. Both machines were ordered by SJ Bennett Engineering Ltd, an English company based in Kendal. This company has been operating since 1959, dedicated to the development of specialist machinery, the manufacture of components and the final installation of the same, with experience in a wide range of materials. In its endeavour to achieve a high quality product for its customers, SJ Bennet Eng. started on a program to invest in new up-to-date CNC controlled production equipment in order to complement its traditional artisan skills. In this quest for modernisation, higher quality and customer satisfaction, this engineering company looked at second hand CNC milling machines, and finally opted for the retrofitting quality of the CORREA milling machines, achieved by NC Service. Therefore, NC Service retrofitted these two milling machine, to subsequently install and commission them at the facilities of SJ Bennett. As a result, these machines now form part of this company´s production capacity, and are operating to the complete satisfaction of our customer. Both are fixed bed, rotary table with a longitudinal travel of 2,500 mm for the CORREA CF22/25 and 2,000 mm for the CORREA CF22-Plus, offering 800 mm on the X and Y axes alike. Amongst other features, both milling machines are equipped with a Heidenhain numerical control, universal head with a hydraulic tool clamp, electronic hand wheel, independent slideways with tempered steel inserts and resin counter-guides on all three axes, tempered and ground ball bearing spindles in all movements and a hydraulic counterbalance for the vertical movement. During the complete mechanical retrofit process for both milling machines, NC Service dismounted and inspected all the functional elements in order to adjust, repair or replace each one, as the case may be, (motors, heads, seals, bearings, spindles, etc.). In its endeavor to meet customer requirements and to offer a high-quality service, it was also necessary to repair all the electronics. 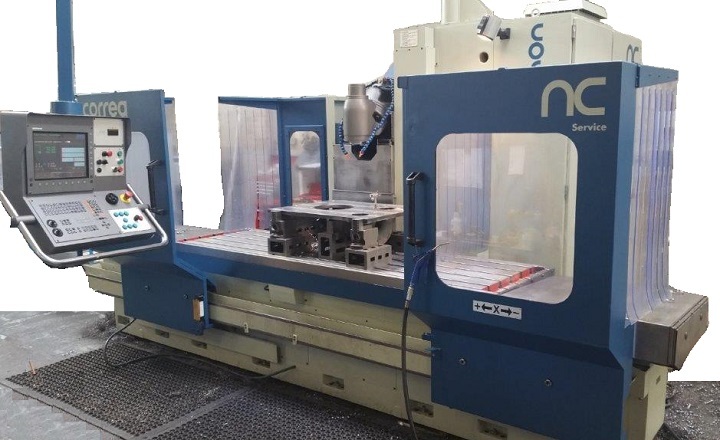 The process included the initial disassembly, cleaning and repair of any damaged items and the final assembly, for the numerical controls and the switch panels, thereby guaranteeing the productivity and reliability of the NC Service retrofitted milling machines. With these CORREA milling machines, SJ Bennett Engineering Ltd will be in a position to offer excellent quality in all the machining work performed, combining precision and efficiency, thanks to the professional retrofitting work carried out by NC Service.